The Translational Research Internship Program will not be offered for Summer 2017. The information on this page is provided for reference purposes only and describes program parameters from Summer 2016. The Translational Research Internship Program is designed to provide UConn undergraduate students with greater insight into the physician-scientist career path (combined M.D./Ph.D. program). First and foremost, the internship gives participating students the opportunity to perform basic science research under the direction of a faculty member in a University of Connecticut Health Center (UCHC) laboratory. Further, students will gain a better understanding of the clinical side of medicine by shadowing a physician/surgeon. Students will have the opportunity to see firsthand the interplay of biomedical research and clinical medicine: how clinical medicine influences and inspires basic research and how basic research translates into therapies used in the clinic. In addition, students will be mentored by an M.D./Ph.D. student, allowing for more informal discussion about research and life as an M.D./Ph.D. student. 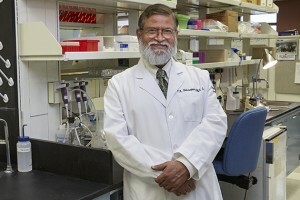 The program will support 1-2 undergraduate students from the University of Connecticut to participate in a 10-week summer research internship under the direction of Dr. Pramod Srivastava, Ph.D., M.D., Professor of Immunology, Eversource Energy Chair in Experimental Oncology, and Director of the Carole and Ray Neag Comprehensive Cancer Center. Interns will have the opportunity to work either with other researchers on a current lab project or on their own project. Students will be expected to present the results of their research in a lab meeting at the end of the summer. They will also be expected to share the results with a wider audience by presenting a poster at the Frontiers in Undergraduate Research Poster Exhibition. Although the majority of internship time will be spent in the assigned lab (approx. 85%), another key aspect of this internship is the opportunity to shadow a physician/surgeon in the cancer clinic at UConn Health. Interns will benefit from regular meetings with an assigned mentor who is a M.D./Ph.D. student. All students who are selected for this internship will attend departmental seminars, journal club presentations, research in progress talks, and public Ph.D. thesis defenses as a means to better understanding the physician-scientist program. Prior lab experience is strongly preferred. Applicants must arrange for the submission of two letters of recommendation, including at least one letter from a UConn faculty member. The internship will run from Monday, May 23, 2016 through Friday, July 29, 2016 (start and end dates are approximate). Students will work 40 hours per week. Students will receive a stipend of $350 per week over the course of the internship. Additional funding (up to $500 per month) may be available to students who require housing in the Farmington area. The application for the Summer 2016 program is closed. The Summer 2016 application is now closed. Applicants should review the application outline prior to initiating an online application in order to ensure that they have assembled all required information. As part of the application, students must upload answers to a series of questions; we encourage the use of this fillable Word file for this purpose, which can then be saved in PDF format and uploaded. Note that applicants must also upload a current resume or CV. In addition, please ensure that two letters of recommendation are emailed (from the recommender’s professional email address) to our@uconn.edu by the January 6, 2016 deadline. At least one letter of recommendation must come from a UConn faculty member. Your assessment of the student’s chances for success and why this research opportunity would further his or her development as a scholar/researcher. Please send your letter (from your professional email address) to our@uconn.edu with the subject line: Translational Research Recommendation – Applicant’s name. Letters of recommendation should be received no later than Wednesday, January 6, 2016. Any questions or concerns about recommendations should be emailed to our@uconn.edu. You may also contact OUR by calling 860-486-7939 – we are happy to answer any questions you might have! All applications will be reviewed by a small review committee convened by the Director of the Office of Undergraduate Research. By the end of January, up to four candidates will be recommended to Dr. Srivastava for evaluation and possible placement. Final decisions will be made by Dr. Srivastava as quickly as possible thereafter. The student demonstrates an interest in both medicine and research. The student possesses a strong background in science, as evidenced by his/her UConn transcript. The student has prior lab experience. The letters of recommendation provide strong support for the student’s candidacy. Since I had AP credit, I didn’t take two semesters of general Biology and/or Chemistry at UConn, but I’ve taken other courses in those fields. Does that make me ineligible to apply? I am interested in participating in research at UConn Health in a different lab than the one listed above. Is that placement possible? Can I apply for both a Translational Research Internship and a SURF Award (or a UConn IDEA Grant)? I have questions about the Translational Research Internship. Is there someone I can speak with? Specific courses are not required in order to be eligible for this program. The mentoring faculty are looking for a “strong background in science,” which you can build by taking a range of relevant courses. A track record of academic achievement in these courses will make you a strong candidate for this opportunity. At this time, the only confirmed participating lab is that of Dr. Pramod Srivastava. You may submit applications to two of these programs simultaneously. However, if you are offered both opportunities for which you applied, you will need to choose between them as there is insufficient time during the UConn summer break to complete both. The Translational Research Internship is a full-time commitment for the duration of the internship. I have questions about the Translational Research Internship Program. Is there someone I can speak with?